Thank you for helping me to accomplish the wish of "being a mommy". The treatment with egg recipient is the last alternative to adoption for an infertile couple. When the wife's ovulation function is lost, an egg provided by a third party may be combined with the husband's sperm and implanted into the wife's womb as an assisted reproduction. Who needs a egg recipient? Women with premature ovarian failure, abnormal ovarian function due to congenital factors or abnormal chromosome, advanced age, or poor egg quality. Treatment with sperm recipient is the last alternative to adoption for an infertile couple. When the husband cannot produce healthy sperm due to congenital or acquired factors, the sperm provided by a third party may be combined with the wife's egg and implanted into the wife's womb as an assisted reproduction. Who needs a sperm recipient? The Act on Artificial Procreation prescribes: men with azoospermia, lack of healthy sperm, and severe genetic diseases. We will help you and accompany you all along the significant journey with courage and love, as long as you are willing to take it. Once you are matched with a recipient, you will be informed to start taking ovulation drugs on the 2nd day of your period. Please call the clinic on the first day of your period. 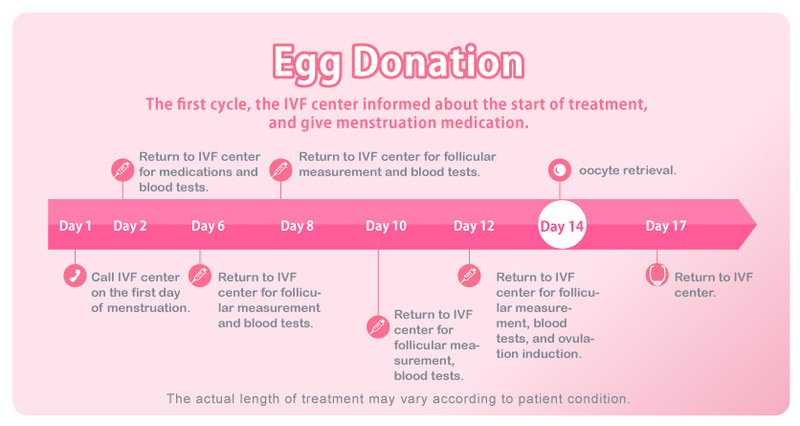 During ovarian stimulation, egg donors are monitored closely through blood tests and transvaginal ultrasound that measures follicle size. Two to three visits to the clinic are usually necessary. After around two weeks, when the eggs have reached maturity they will be retrieved. Nutrition payment (at most NT$ 99,000) will be given according to the quantity and quality of the eggs. If there is any discomfort after the procedure, please come back to the clinic.